Dr. Jon Marc Van Slate offers in-office and take-home teeth whitening solutions to help you achieve a brighter smile. He can discuss the various factors that affect teeth whitening cost during your personal consultation at his Houston, TX, dental practice. Dr. Van Slate has extensive teeth whitening experience and will ensure your smile is brightened to a natural shade that complements your skin tone and facial features. He will also consider your budget, and review the factors that can affect cost, such as in-office vs. take-home treatments and length of treatment. The degree to which your teeth are stained: The more stained your teeth are, the longer and more intense of a treatment you will likely need. You may require a stronger formula to achieve a whiter smile. 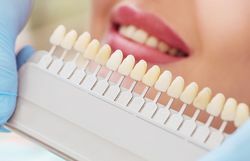 Though most patients’ smiles can be whitened by as many as eight shades in a single in-office treatment, some patients may require more than one treatment to achieve their goals. In-office vs. take-home treatment: Although an in-office treatment provides you with immediate results, it is often more expensive than our take-home alternative. You should carefully weigh your options and determine if faster results are worth the higher price. Combining treatment with other cosmetic procedures: Professional teeth whitening cannot whiten deep, intrinsic stains. 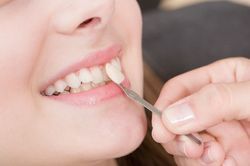 If certain stains do not respond to your teeth whitening treatment, you may choose to conceal those stains with porcelain veneers or dental bonding. If Dr. Van Slate suspects you may need these treatments ahead of time, he can design a comprehensive smile makeover treatment to address all cosmetic issues. Professional teeth whitening is a relatively affordable cosmetic treatment. Whether you choose in-office or take-home treatment, in as little as one office visit or two weeks, you can enjoy a whiter and brighter smile. It is safe and non-invasive, and more effective than the over-the-counter alternatives. A whiter smile not only improves your appearance, but can improve your self-confidence as well. 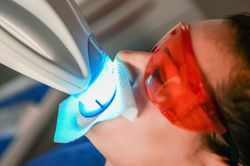 Though your cost will vary depending on the treatment you choose and your individual needs and goals, teeth whitening is one of the most cost-effective cosmetic treatments available. You may feel more confident in personal and professional settings after having your teeth professionally whitened. Teeth whitening can make your smile appear healthier, and also help you look several years younger for a rejuvenated look. For a small investment, teeth whitening can dramatically transform your appearance and improve your self-esteem. Though your cost will vary depending on the specific treatment you choose and your individual needs and goals, teeth whitening is one of the most cost-effective cosmetic treatments available. Dr. Van Slate will carefully select a brighter shade that will give you the whiter, healthier, and natural-looking smile you desire. Contact our dental practice today to schedule your teeth whitening consultation.